How ironic is it to think that my last post was about sadness and loss and the eagerness to find the right words to say when the wrong thing happens... and now I am back to write about a blessing that just came into our lives... a "surprise" baby. I know all most of my friends and family members are totally surprised to find that we are expecting again.. believe me.. so are we.. we have gone through every possible emotion in the spectrum... first it was shock, then anger, fear, denial, hesitation, disbelief and after a while came happiness which has slowly turned into gratefulness and anticipation. Here's the back story... I had been feeling very sick for 3 weeks and by sick I mean MISERABLY sick.. crazy nausea that would give me chills, unmanageable fatigue, sensitivity to smells, foods, etc. I told myself my body could be "off" from a very rocky start to the year (we had all been sick with strep, bronchitis and such).. time went by and I admitted that "something" was up since feeling so miserable could not be my "status quo". I asked Iggy to drive me to the pharmacy and I bought a two-pack pregnancy test to convince myself that it was probably all in my head; after all, we had the "perfect" little family of four with two kids meticulously spaced in age and already independent enough for my liking.. I peed in a cup (in case I needed some *extra* pee for the 2nd test...sorry TMI) and as soon as I took the test with Iggy by my side...there they were, DARK and BRIGHT.. TWO LINES! I almost fainted, I started to cry and told myself this wasn't possible... How could this happen to ME? The person who counts days and plans everything to the "T", surely this had to be a joke... and a very cruel one too! I decided that the two-pack test I had bought was defective.. yeah..that was it.. defective tests.. two in a row...it had to be! So off to the pharmacy again to buy two more tests.. I quickly dipped them into my pee cup (yes I saved the pee) and boom..there it was again.. a positive result... TWO additional positive results... Ok.. now it was real.. OMG.. this is REALLY happening.. I felt dizzy.. my first instinct was to call a friend who had a "surprise" baby a few years back when her twin daughters were 10 years old... She answered and I said "I need a friend"; her voice sounded shaky when she said "what's wrong?" and the words just wouldn't come out of my mouth.. to which she quickly reacted by saying "are you pregnant???"... and for the first time I said it out loud.. Yes! I am PREGNANT! The next few hours were made up of a mix of emotions, most of which were bad. I can't say I was disappointed but I definitely wasn't "happy".. and as much as I hate to admit that happiness was not my initial feeling, I gotta be honest and say that it took me a while to digest the news. As much excitement as a new baby brings, it also brings a lot of fears, responsibilities and trouble (and I say this in the most loving way possible). I guess I wasn't sure we were ready for this! I know it's not the end of the world, but this was definitely a curve ball! A few hours later, I told my mom and spoke to Iggy about it.. He seemed strangely happy and calm; he very lovingly told me "We got this!" and just went on with this day. I kept asking myself why he wasn't freaking out or getting upset about the news, but that's how my husband is....loving, patient and understanding and that's exactly how he reacted... Thank you, my love! Of course I took another test (a digital this time), just to be EXTRA sure... Iggy just kept laughing and telling me to save the money for diapers instead! ha ha ha! I spent the next few days working through my emotions; trying to figure out what exactly I was feeling and processing the prospect of a new baby and the impending changes in our family dynamics. I scheduled a doctor's appointment and bought prenatal vitamins... I was ready to accept it.. I was ready to get excited and happy about it. I had a few of the sweetest people approach me and tell me their "surprise" baby stories and they helped me realize that my feelings were completely normal and acceptable. I wasn't crazy! I wasn't being an ungrateful mother who rejects a blessing from God; I was simply reacting like any person would to this kind of news.. so, to those people who reached out.. thank you... (you know who you are).. your words meant the world to me and you are the reason I was able to jump from shock/denial/anger to happiness and excitement. 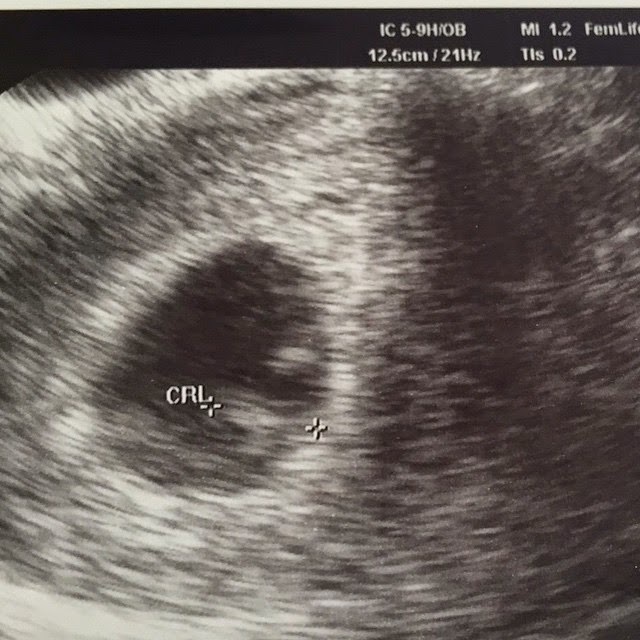 My appointment went on without a hitch, everything looked great and normal; turns out I am 8 weeks along and was given an estimated due date of October 2nd. I hesitated when making the decision of when to tell the "world" about the news but then I said "hell, I'm ecstatic! and babies should be celebrated for however long we have them!" So here are my news... We're having a baby! and we are excited as heck and we are praying hard for a healthy and successful pregnancy and we can't wait to hold this little one...and whether or not something goes wrong (I am aware many things can happen), THIS is a happy time, which is meant to be celebrated because it is a BIG DEAL! There's something about "sharing" sadness that makes me feel so torn. One on hand, I know that understanding someone else's sadness helps that other person so much but on the other hand, I wish I could take that sadness away completely instead of having to "share" it with a loved one. It's so painful to see people suffering around me; not being able to do more than wipe someone's tears or say a few comforting words can be very frustrating...and that's exactly what I felt yesterday after we received the dreaded call informing us that Iggy's grandma had suddenly passed away. How sad, how terribly sad that moment was...seeing the tears stream down Iggy's face. In that instant I wanted to suffer FOR him instead of suffering WITH him; I wanted to take his pain away and come up with something to say that would make him feel better, something that would make him see that if I could take that sadness and feel it alone, I would. Death is so incredibly painful, we can't make sense of it and as we start think of the void in our hearts we tend to feel overwhelmed and question our ability to "move on" without that person in our lives. I guess that's what Iggy is feeling right now; he's trying to make sense of her passing, of the idea of her absence and thinking about the memories that she leaves behind. I am just here...sharing his sadness, trying to make him feel better and grasping this new reality where there are no more "great-grandmas" in our family (she was the last one alive) and where life must go on with the hope that she is now in heaven resting in peace and watching us all from above. Today I pray for Yolanda's soul and for our family's peace and comfort. I thank God that I was lucky enough to meet her and blessed to have seen her just a couple of months ago. I am thankful that the girls got to enjoy her and hope that they will always cherish the time they spent together. 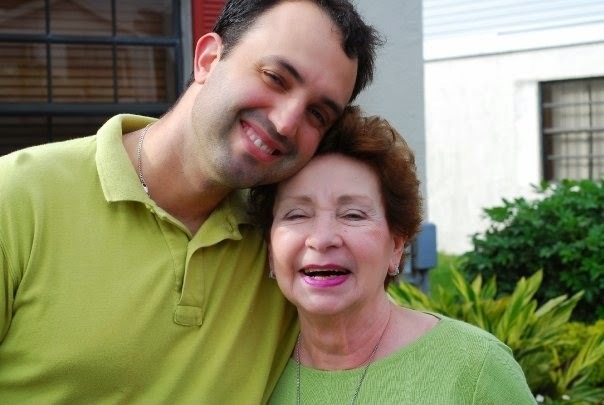 Rest in Peace, abuela! You will be missed!